A Book Fair is a partnership between a seller of books (and perhaps other merchandise) and a school, with the goal of giving students and their families access to educational products while raising money for the school. 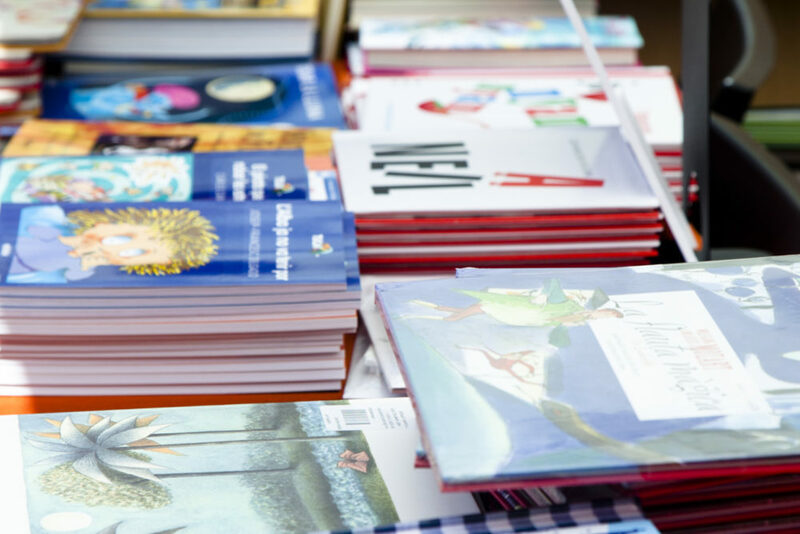 Parent volunteers work with representatives from the seller to organize these events on school property and during school hours where children can peruse and purchase books with the help of their teachers. The provider delivers the merchandise to school and often provides promotional tools (posters) and display items to make the fair attractive. Depending on size of fair and choice of partner, the event can be a sizeable fundraiser, more on that to follow…..
How do we set up a Book Fair? Well known retailers, e.g. Scholastic, offer a more organized approach and will provide mobile, easy-to-access cases that not only provide safe storage for the books but also keep books displayed face front. Definitely choose to group books by grade level and interest and do your best to make it look and feel like a real book store. If space isn’t an issue you can choose a retailer who does not offer the use of locking carts and you can simply leave the books set up in a locked room overnight. Booksmart is an example of a retailer that has an attractive plan but doesn’t provide carts. Of course, partnering with your local Community Bookstore can be an excellent option too. How many volunteers are needed? Certainly one person needs to be on hand to set up and “open shop” every morning. It is wise to have at least two people to cover each shift when students are coming to shop – one to help them navigate the Book Fair (in addition to their teacher) and one to facilitate check out. Who selects the books and what is available? The selection of books that you have to pick from depends on the retailer. Having input from teachers and/or school librarian ahead of time will help make sure that the selection is appealing. Make sure to include some classics as well as the latest award-winners and most popular books. Make sure that there are books for every grade level at a range of prices. Parents may be tempted to buy hardcovers but have plenty of softcovers for the children. Value packs of series books will also be popular when teachers come to shop. Make sure that you put a plan in place to restock if your fair lasts longer that 4 days. What is the optimal time of year to hold a Book Fair and duration? Fall is a great time for Book Fair especially if parents are encouraged to shop for Holiday gifts. Having dedicated parent hours either after school or even to coincide with parent/teacher conferences can be beneficial. Depending on the size of the school and its community, a week +/- is a typical duration for a Book Fair. How does the school get rewarded? At the end of the Fair, the school is usually awarded a percentage of the revenue. Some partners, e.g. Scholastic, offer books and educational materials at a steep discount as well as or instead of a straight dollar reimbursement. The PA/PTA may decide to offer a modest stipend to cover the cost of a book for children who might not otherwise be able to purchase one. The PA/PTA may also choose to allow teachers or the school librarian to shop at a discount (to be taken from the overall profits) for their classrooms.